It’s a rough first day for replacement Yeoman Mia Colt. Not only is she replacing a beloved murdered yeoman but she arrives just as their preparing the bodies and worrying about the wounded. She is not given a warm welcome, especially by Pike who even gets mad at her when she tries to say some kind words. Then day two brings the events of “The Cage” (or the flashback in “The Menagerie” if you prefer), where Colt and Number One are dragged into the Talosian plans to create a worker race to restore their planet. They even try to manipulate her with thoughts of the man she left behind, except he was killed after that and she realizes she would still make the same decision. In the end her determination proves herself to Pike and Number One, who both make peace with her, bringing her into the crew. What they got right: I’m not sure how well this ties in to Colt’s intended history but that character never got past the pilot. That said, I don’t think it’s a bad introduction considering the previous yeoman was so important to the Captain, and I think made a good showing to the audience in the three issues we had with him. Nano, an outsider himself, and the kind Doctor Boyce (who’s subplot better reach the main plot soon for his mental health) are kind to him, Number One is rather cold to her but she’s hardly depicted as the warmest of personalities, and Pike’s anger is understandable but not treated as warranted, especially to Colt. While the story is told through her personal log it’s not unbiased. What they got wrong: I’d have to double-check but there might be some minor differences in dialog for the scenes taken out of the pilot. I don’t remember the Talosians spilling the fact that Number One had fantasies about Pike, but I could be wrong. Other notes: It’s going to be some time before we get to it, but I’m betting showing the Talosians is also important to a later story arc in the other Paramount titles that came later, “The Telepathy War”, a crossover taking place in all the 24th century titles under the imprint. Since I’m doing these in relative chronological order we won’t reach that time period anytime soon. Recommendation: A good retelling of the story and introduction for Mia Colt. I like her here and I look forward to seeing more of her. Worth reading. 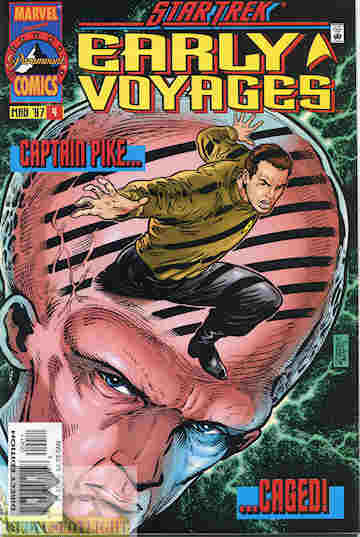 Posted by ShadowWing Tronix on February 13, 2019 in Television Spotlight, Yesterday's Comics and tagged Christopher Pike, Marvel Comics, Number One, Paramount Comics, Star Trek: Early Voyages, Talosians, The Cage, The Menagerie, Yeoman Mia Colt.